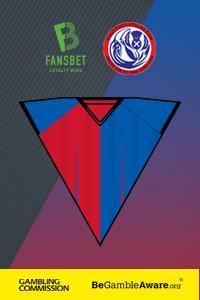 Hey Caley Jags fans, it's Hampden week as the build up to the Scottish Cup semi-final starts in earnest. Remember this image? What a history making day that was for the club. Legends every one of them. We had to do it without the suspended Gary Warren. Well Deja Vu! We will have to get through this one without our inspirational centre back Coll Donaldson who will be suspended, possibly even injured as well after hobbling off against Ayr. That's us done with the Championship for now as we take a sabbatical after beating Ayr United to jump back to third in the table. However, we have bigger fish to fry. That Championship sabbatical takes us back to Hampden for the first time since May 2015 when we did not too shabby as we lifted the Scottish Cup having beaten a resilient Falkirk 2-1. Our previous visit to Hampden saw an even greater performance as we put Celtic out of the Scottish Cup after an enthralling 3-2 win. Scenes! 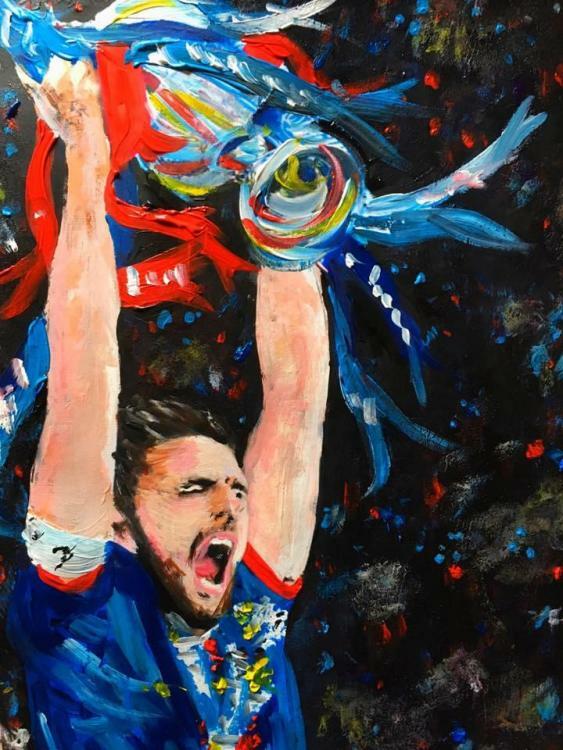 It all ended in 2015 with Graeme Shinnie holding aloft the Scottish Cup as depicted in Sopie Robb's fantastic painting. Let's start by giving you a wee flavour of these occasions and the build up to this seasons competition. We will add something every day as the countdown continues, so check back on here daily for new updates. Inverness thistle were doing their own bit of giant killing culminating in their most memorable scalp, a 3-0 thrashing of Kilmarnock at Kingsmills in season 1984/85. The reward for this would be a trip to Parkhead. What a day that was, February 9th 1985. There were 'Big Kilmarnock Bunnet's' lying around the terraces and across the playing surface amongst a carpet of Kilmarnock supporters scarfs strewn across the pitch. They were not a happy bunch at full time looking to lynch the Killie board. Goals from Dave Milroy, Gordon Hay and Brian Fraser gave Killie there worst ever Scottish Cup defeat, something that still hurts them to this day. The Jags went on to play at Parkhead in the Scottish Cup in 1985 and suffered at the hands of a strong Celtic side. A certain Jimmy Calder being a substitute for the Jags at centre forward! And following on from that dramatic defeat of Celtic at Hampden, we went on to lift the trophy at the same venue against Falkirk. And that's why Sophie got her paint brush out and reproduced that moment. So that brings us to this season, the William Hill Scottish Cup 2018/2019. The top three scorers so far are the prolific Stephen Dobbie - 7, Jordan White - 6 and Scott Sinclair - 5. It all started rather innocuously for the Caley Jags, a 1-1 draw with Edinburgh City at Ainslie Park. Shaun Rooney got the cup run off to a good start in the sixth minute but thereafter we struggled to make any improvement on the scoreline and the Citizens got their just reward when Liam Henderson sent the tie to a replay with five minutes remaining. The word embarrassment was used to sum up our performance on the day against League 2 Edinburgh City. The replay saw Jordan White score a hat-trick at the Caledonian Stadium as we ran out 6-1 winners. Tom Walsh (2) and Aaron Doran were the other scorers for the Caley Jags with Blair Henderson scoring for the visitors. Non League East Kilbride were next, and we only needed one game to dismiss them, albeit we made hard work of it and that's credit to Kilby who showed they were a well organised side. White, Doran, Polworth and an og saw us ease through 4-0. On the Sunday after our game, Hearts began their Scottish Cup challenge with a fourth round win over Livingstone thanks to a goal from Sean Clare. Our 5th round game would be a derby against County at Dingwall. This one would end in a 2-2 draw with County equalising in the third minute of time added on. We had led twice, Aaron Doran put us ahead before Ross Stewart levelled ten minutes after the break. Jordan White restored our lead until the tie was sent to extra-time by Josh Mullin. The previous day Hearts progressed by putting Auchinleck Talbot to the sword by 4-0. Berra, Mitchell, MacLean and Keena were the Jambo's scorers. The replay at Inverness against County was full of drama and the game went to extra-time and penalties. 2-2 after ninety minutes with no further scoring in extra-time led to a nail biting penalty shoot-out. Mark Ridgers woud make one save and Inverness converted all five from the spot to seal out place in the draw for the next round at Tannadice. The first team into the semi-finals were Celtic who beat Hibs 2-0 at Easter Road. We were second into the semi's after a wonderful 2-1 win at Tannadice where Joe Chalmers scored the goal of the round, an absolute peach. We were pegged back unjustly when Paul McMullan went down in the box but Aaron Doran scored with a header in time added on to put us on the road to Hampden. Aberdeen and Heart's would make up the semi-final pot after both won replays. The Don's dumped Rangers out and Hearts removed relegation threatened Championship side Partick Thistle 2-1 at Tynecastle. All the questions would be answered as the draw was made and the replays were completed on 12th of March. Hearts at Hampden and surprise surprise a 12:15 kick off. Plenty of previous between the sides although only one brief encounter this season. We played Hearts at Tynecastle in the League Cup and were summarily dismissed. Three goals in four minutes ended this contest before half-time. Here's a name that will send shivers down the spine of the Inverness defence. Uche Ikpeazu bulldozed his way through our defence on numerous occasions and scored twice. Odd game to be honest. We were a bit naive and paid the price for being too open and having a go. It ended up being a hammering. Oh well, there's always next time. We have a few players who have tasted life at Tynecastle. Keeper Mark Ridgers was on their books for seven years but only made three first team appearances. Brad Mckay made 40 appearances for Hearts in five seasons from 2010 onward. Kevin McHattie is the latest signing and he was on the books at Tynecastle for four years, pulling on the maroon shirt 83 times. However, there is one man at Inverness who beats them all, and he is a legend down Gorgie road. Inverness manager John Robertson. Robbo played 512 times for the Jambos in his 17 year affiliation with the club. In two spells at Tynecastle he scored an incredible 214 goals. He has raised the Scottish Cup before, he was an unused sub in 1998 when Hearts beat Rangers to win the trophy. Wee Robbo loved a derby goal, scoring 27 times against Hibs and has 16 Scotland international caps. He also managed Hearts for a short spell before being removed in one of Hearts' revolutions. There is one man who has made the transition in the opposite direction. Pacey winger Jake Mulraney who could well be in the Hearts side at Hampden after making some recent appearances for them in the Premiership. As seen in the Jamie McCart interview, he is on the mend although it's touch and go whether he will be fit enough to start. Coll Donaldson is suspended after picking up his bookings in previous rounds. Sean Welsh is out for the season with a suspected broken bone in his foot and Anthony McDonald is ineligible due to the loan arrangement from parent club Hearts. Three of the 2015 Cup Final squad will be involved on the park on Saturday. Captain Carl Tremarco, influential midfielder and chief provider Liam Polworth and on form Irish wide player Aaron Doran whose goal at Tannadice got us into the semi-final. It's a big ask of the players against a solid Hearts side who came into this tie on the back of two championship defeats. A 3-0 away loss to Rangers and a 2-1 derby defeat at Tynecastle against Hibernian. Our last game was a hard fought 1-0 win at Somerset Park against the 'Honest men'. Hearts will be without long term absentees Steven Naismith and Ben Garuccio. Demetri Mitchell has returned to Manchester United. Bobby Burns could be in for a starting slot at full back but, unlike John Robertson, Levein has plenty of options to cover most eventualities. We will be outnumbered around 10/1 in the stands. On paper, it all points to a win for the Premiership side, however, we have previous with Hearts, even with nine men.